The first Y-Chromosome User Workshop was held in Berlin in April, 1996 and sought to bring together leading scientists in the fields of population and forensic genetics to explore the utility of the Y chromosome. The short program included plenary contributions from Chris Tyler Smith, Mark Jobling, Peter de Knijff and Manfred Kayser and included a round table discussion that ended with a section on establishing guidelines for the application of Y-Chromosomal STRs in forensic casework. Twenty-two years later, at the start of the 11th Haploid Markers Conference on May 17, 2018, Prof. Walther Parson (Medical University Innsbruck) and Dr. Lutz Roewer (Charite University Berlin) admitted their surprise and delight at how this unique conference has grown and strengthened while still holding true to the core precepts of the first workshop. More than 200 attendees shared their exploits with mtDNA (described by Prof. Walther Parson as ‘the most beautiful genome’) and Y-chromosome markers via a program that still combines forensic and population genetic disciplines to better understand the capabilities of these marker types. The plenary program included a keynote presentation from Prof. Mark Jobling which eloquently explored the burgeoning topic of Massively Parallel Sequencing, and the multiple MPS presentations in the 4-session program highlighted how much this technology is becoming an integral part of the forensic consciousness. The Verogen Lunch Seminar on May 18th included presentations on different approaches to MPS implementation by Maria Wrobel (Institute of Forensic Research, Krakow) and Dr. David Ballard (King’s College, London). 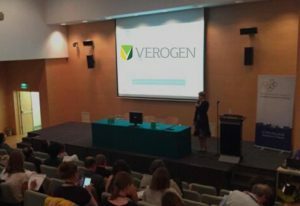 In line with this continuing trend, Verogen was proud to host our first lunchtime seminar in association with this conference and welcomed contributions from Maria Wrobel (Institute of Forensic Research, Krakow) and Dr. David Ballard (King’s College, London). Both speakers represent laboratories who have taken different but equally successful approaches to implementing MPS methods with the intention of benefitting a range of different casework scenarios. Their experiences illustrated how there is no one right way to implement this technology and that the inevitable learning curve involved is well worth the ultimate benefits that can be realized. Verogen also announced a series of practical updates to our portfolio to support implementation and casework use. These include the upcoming release of smaller library prep and sequencing kits to facilitate low throughput use, much requested by our partner laboratories, as well as a new version of the Universal Analysis Software that allows access to flanking region data, supports greater portability of data and introduces an audit trail to protect data integrity. To add a bit of fun, we tested the MPS knowledge of the attendees with a quiz and, after an enthusiastic response, the lucky winner of a SONOS Play:1 wireless home speaker was Cordula Haas from the University of Zurich. Congratulations Cordula! The Haploid Markers community has broadened the understanding of these valuable marker types and developed tools to facilitate their use. MPS methods offer the opportunity to combine the analysis of higher numbers and expanded combinations of markers; therefore, Verogen looks forward to continued collaboration with this community to promote the analysis of haploid markers and elevate their impact on forensic outcomes.